VIP Bus from Vang Vieng to Luang Prabang, Laos. I boarded the VIP Bus headed to Luang Prabang, a bit relieved to move on to the next portion of my travels. 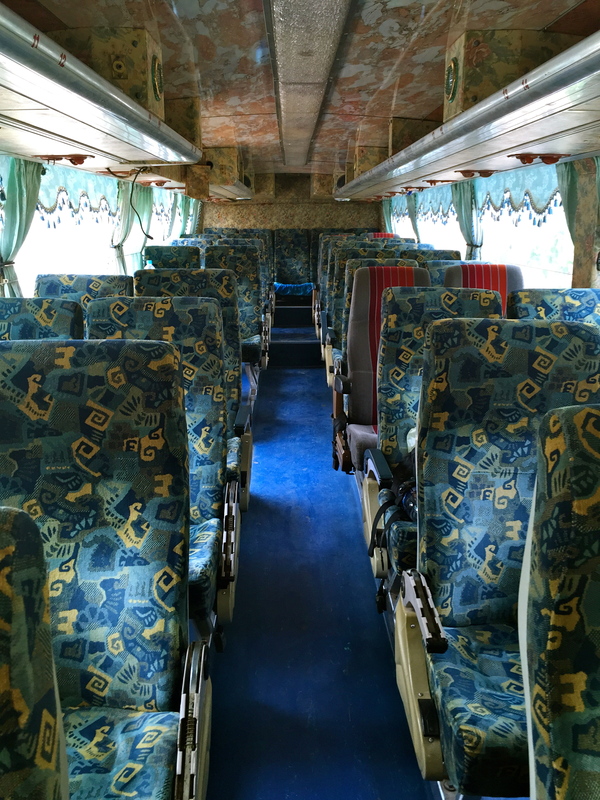 The bus looked like it could have been built in 1990 with its blue and yellow patterned seats, floral paneled ceiling, missing arm rests, and dust-caked, tasseled curtains. I found my assigned seat and was happy to spread out for the 6-hour journey since the bus wasn’t full. I knew it was going to be a slow, bumpy ride, and I was hoping to sleep a bit because I hadn’t slept well for the past two nights and my body was pleading for some relaxation after three very physical weeks of working on the farm garden. This bus ride marked the end of my volunteer work in Vang Vieng and I was leaving with mixed emotion. As we began our ascent into the mountains and the bleary countryside crept past my filmy, streaked window, I had an opportunity to reflect on the past weeks, that seemed almost as blurry as the scenery. It felt like so much had happened, yet one day melted into another as my routine melded into place and it was only the mental determination that differentiated one day from another. 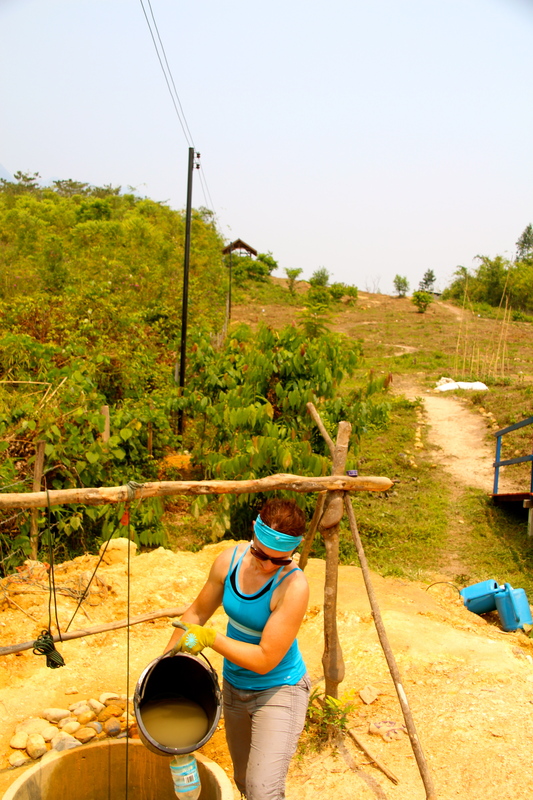 I highlighted Week 1 in Juggling Act – Volunteering in Vang Vieng. Weeks 2 and 3 were dedicated entirely to the garden since the construction on the secondary school was almost complete and I wasn’t asked to teach. During our Saturday planning sessions I learned that the purpose of the garden was waning a bit. It was originally intended to increase funding for the education programs through the harvesting of fruits to be used for making and selling jam, a talent that Davone, one of the program managers, had developed. Unfortunately, in test sessions of selling the jam to local hotels and guesthouses, they found that it didn’t sell well, so they were still looking for other ways to leverage the fruits of our labor in support of the existing school education programs. At the very least, the fruits and vegetables would be used to supplement the groceries for the volunteer house. Either way, I work much better with some clear priorities, so during our planning sessions, we made a list of what we could accomplish. 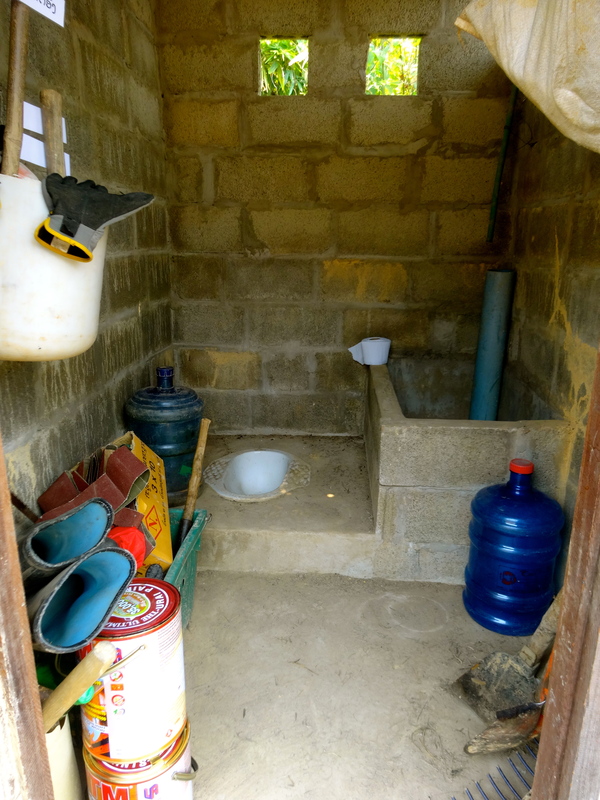 Our newly refurbished toilet / shed… we just kind of make it all work. Lettuce in our vegetable beds. used as the toilet. Sai, our program manager, weed whacked nearly the entire lot. 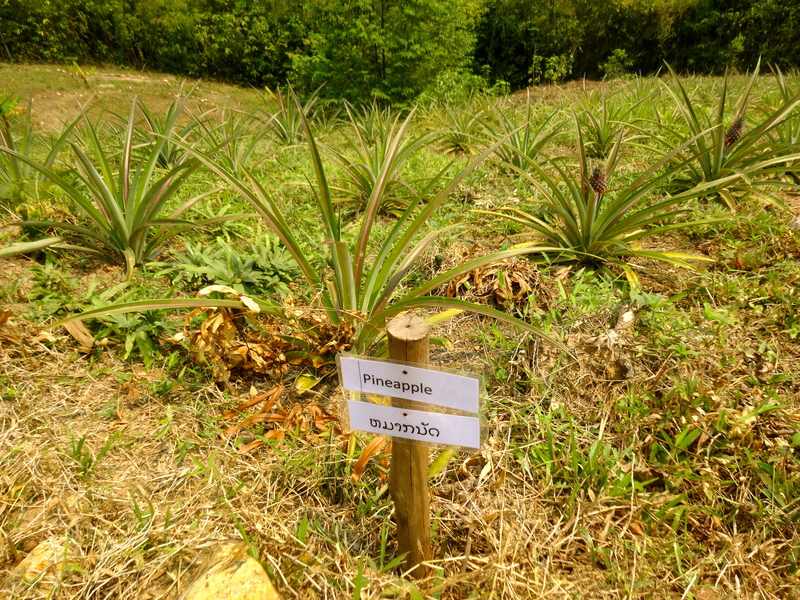 We made labels in both English and Lao to post next to our plants and trees, weeded vegetable beds, cleared out branches, laid stones around our muddy well, and transplanted papaya trees. Every night, Sanne and I went back to the house and researched how best to care for a specific plant or tree, how to test the soil, what to use as fertilizer, or how to build a compost bin in order to relay the information to Sai or offer suggestions. We also sanded and started painting our hut, which offers the only shade in the garden and is where we eat our lunch everyday. And, of course, there was always the watering, every day, twice a day. 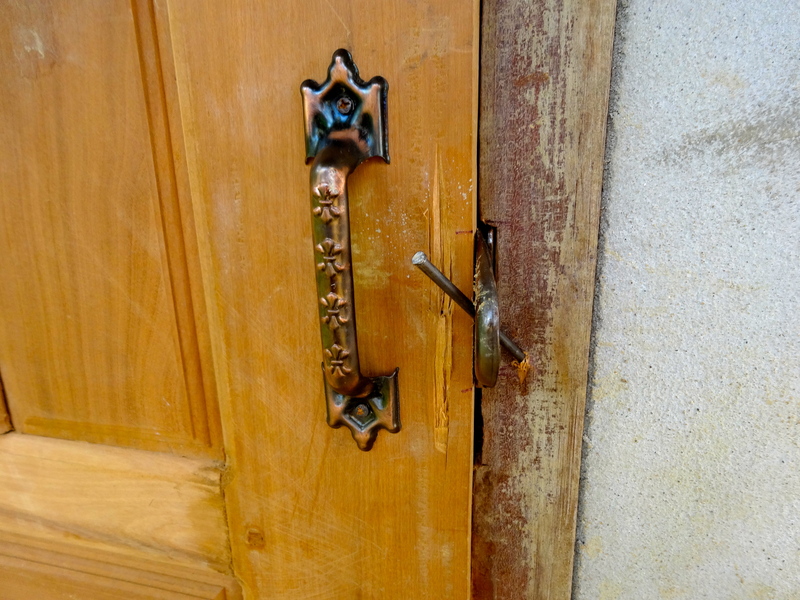 The toilet doors that were nailed shut at the Secondary School in Keo Kuang. During the second week, my donation was utilized to install doors for the toilets at the primary school in Keo Kuang. We drove up there on Friday of that week to inspect the work and were disappointed to learn that the doors were not aligned properly, had cracks in them and were nailed shut. After an hour of trying to ascertain the facts, we were told that the children were hanging on them and banging them closed, which damaged the newly installed hinges. Additionally, drainage was not working properly, so the doors were nailed shut until all could be fixed. I started to wonder if the kids even cared about the doors or the toilets for that matter. With all of my Western sensibility, they were desperately important to me, even if it was just so that I could use a toilet when I worked there, but I wasn’t sure that those kids felt the same way. After all, I don’t think many of them even had toilets in their homes. And lack of proper toilets certainly wasn’t stopping them from attending school. I don’t think the sudden introduction of toilet doors was going to change anyone’s mindset that week. Regardless, I was told that all had been corrected the day before my program departure. To the left is what the garden looked like when they purchased the land… to the right is what it looks like now. 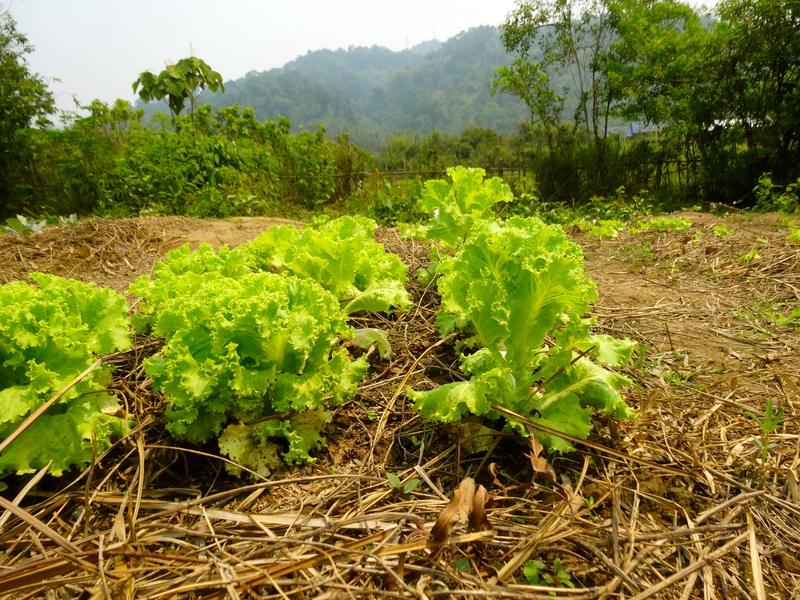 Before arriving in Laos, I’m not sure what I was expecting when I first signed up to work on a farm… perhaps fields full of vegetables or orchards full of trees, or maybe a few animals requiring care. I think I was probably expecting a slightly more established version of what we had since it was my understanding that the land for the farm was purchased nearly two years ago. What I failed to realize, until I got there, was that the land was covered in a jungle of trees and weeds when it was purchased. Clearing that land happened with little more than poorly made handsaws, scythes, shovels and hoes. So, although the garden still has a long way to go before the fruit trees will yield fruit, I had to keep reminding myself to be patient and kind because growth and change, no matter how fast I’d like it to be, usually happens slowly. Slash and burn farming on the drive to Luang Prabang, Laos. My head was bobbling from the rocks and ditches in the road just as much as the thoughts were bouncing around in my mind. As we drove at what was often a mere 15 kilometers an hour, I observed large patches of burning hillsides, smoke billowing into the sky and hanging on the peaks of the hills and mountains casting a haze over the scenery. 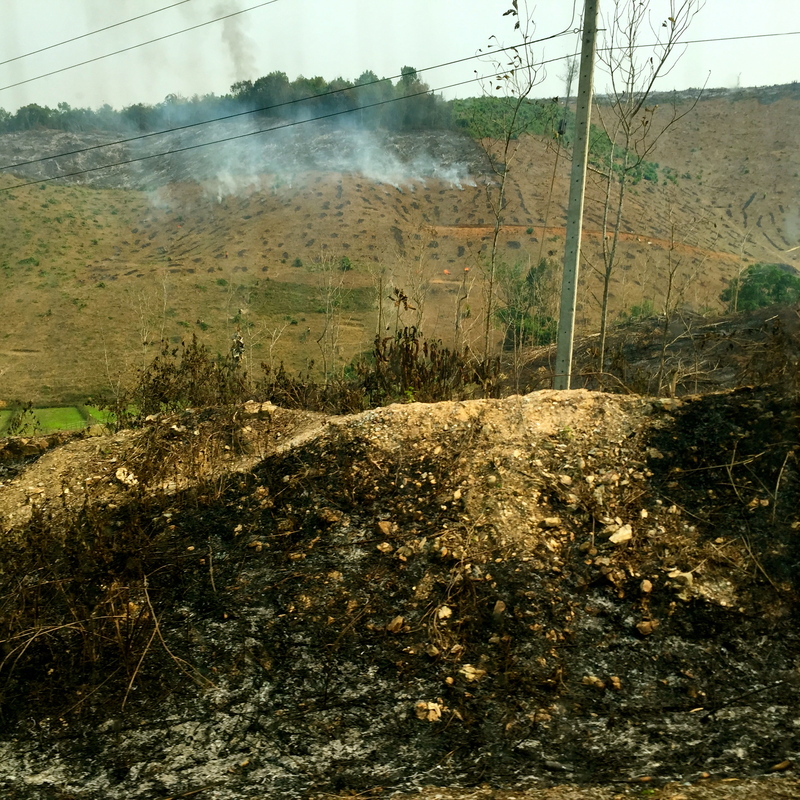 It is the month for slash and burn farming in Laos. The slashing actually happens in January or February, the slashed trees are left to dry in the sun for a month or two, and then the burning typically happens in April before the rainy season starts in May or June. It’s unfortunate because this type of farming is typically only for subsistence agriculture, tends to exhaust the soil in a season or two, and contributes to erosion. The smell of smoke permeated our bus cabin and nauseated me as we puttered up the next hill. I thought… the Fruit Friends garden was not as developed as I had anticipated but at least they didn’t try to clear the land by burning it. They did it the hard way, the better way. Living in the cosmos of the Fruit Friends house, I remembered thinking surely there is more that can be done… surely this could be better organized. Now, having stepped out of that universe, driving through ramshackle villages with litter strewn about the houses; watching naked children play in trickling streams in the midst of the hot afternoon haze, women peddling food or goods on the roadside in tattered clothing, thirsty cows wandering alongside our bus, I realized, the challenges go far beyond the perimeter of the garden lot or the Fruit Friends house. I inserted myself for three weeks… the program managers have lived in the villages in Central or Northern Laos their whole life. Between working with an American NGO, reporting to a Lao sponsored funding organization and abiding by Lao governmental mandates, I can’t judge their endeavor in three week’s time. I can only hope that my three weeks effort helped contribute a little bit to support education and that each new volunteer’s time does the same. Growth happens slowly. Revelling in gratitude for my own educational experiences and opportunities.